Steve Moore is a YouTube star. Even Mike Portnoy's a fan! This Drummer Is At The Wrong Gig - by now, you've probably seen the YouTube video that captures the wildly enthusiastic drumming skills of Steve Moore, who pounds the skins (to put it mildly) for Rick K And The Allnighters ("America's Most Exciting Show Band" they call themselves, and they might be right). It's the video that has, in one week's time, been seen by over 2 million people and has dazzled drummers the world over. Shot nearly two years ago at the Knoebels Amusement Resort in Elysburg, Pennsylvania, it shows the West Virginia-based band serving up a spirited take on ZZ Top's Sharp-Dressed Man (most appropos, given the group's snazzy gold blazers). 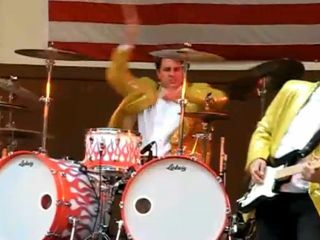 'Spirited,' however, doesn't do justice to the theatrical flair (mixed with serious chops) displayed by Steve Moore, who simply explodes behind the kit, seemingly channeling the ghosts of Keith Moon and Buddy Rich - although Twitter users likened him more to Animal from The Muppets, which is no slam. As for Steve Moore, he told Philadelphia Weekly that he has "mixed feelings" about being known as the 'Drummer At The Wrong Gig' guy. "I can clearly see where it would look like Tommy Lee or Keith Moon playing for Wayne Newton. I get it. A lot of the comments on YouTube, man, they're funnier than hell! I mean, I can laugh at 'em, it doesn't offend me because they're funny, man. Some people really come up with some good stuff." But Moore takes issue with some of the disparaging comments directed towards his Allnighters bandmates. "Everybody in the Rick K. organization, they're great people," he said. "You can love the band and think they're great, or you can hate the band. You know what I mean? But at the same time it's really hard, to a degree, when you see everyone else in the band get ripped to shreds, because they're nice guys." However, Moore's day, week and probably year was made when he learned than Dream Theater's Mike Portnoy had become a fan. "I've looked up to Portnoy, I have everything he's ever recorded," said Moore. "He's like my Neil Peart, my Tommy Lee. Someone dropped me a quick e-mail a couple days ago when this first started and said, 'Dude, I don't know if you know this but Mike Portnoy just Twittered about you.'" In his Tweet, Portnoy said that he had a "new hero" in the Allnighters drummer. Elated, Moore clicked on Portnoy's Facebook page and wrote, "My name is Steve Moore, you said some really nice things about me on your Twitter page and you had the opportunity in your position to rip me to shreds but yet you showed mercy and I wanted to thank you for that." Literally 10 minutes later Portnoy sent him an e-mail expressing his admiration. Moore coldn't believe what he was seeing: "I don't care about money and all that, but to get that sort of respect, you know what I mean, on that level? That guy doesn't look at me and go, 'Oh, that guy's a joke.' That's huge to me, man!" Moore is realistic about the fleeting nature of YouTube fame - although he has gotten calls from a few companies seeking endorsement deals. As for how being known as 'The Drummer At The Wrong Gig' will affect the fortunes of Rick K And The Allnighters, he said, "I'm hoping it has a positive impact but so many people watch it and they go, 'Well that's funny as hell! He looks like Chris Farley! Next....' You hope they remember your name, but whether they will or not, I honestly don't know. Time will tell." For the moment, however, "America's Most Exciting Show Band" have their dance card filled right on through December. For more information, check out their MySpace page.